Birds of Central Asia is thefirst field guide to include the former Soviet republics of Kazakhstan, Kirghizstan, Turkmenistan, Uzbekistan and Tajikistan, along with neighbouring Afghanistan. This vast area includes a diverse variety of habitats, and the avifauna is similarly broad, from sandgrouse, ground jays and larks on the vast steppe and semi-desert to a broad range of raptors, and from woodland species such as warblers and nuthatches to a suite of montane species, such as snowcocks, accentors and snowfinches. This book includes 141 high-quality plates covering every species (and all distinctive races) that occur in theregion, along with concise text focusing on identification and accurate colour maps. Important introductory sections introduce the land and its birds. 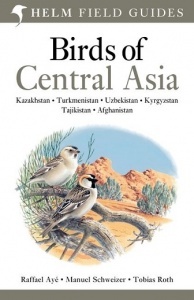 Birds of Central Asia is a must-read for any birder or traveller visting this remote region.